She is 5 inches tall and sure to steal your heart with the twinkle in her impish green eyes..
A single bound is all she needs to land in her pretty little wicker basket. Lolling on the cosy, claret-colored cushion of cotton velvet, our Ginny is relaxing after a morning chock-full of adventure. Only the impish twinkle in her bright green eyes gives any sign of the new plans that she is hatching in her furry little head. Right now, though, it´s time for a catnap. Ginny Kitten is 5 inches tall with a red tabby coat of finest mohair. She is 1-way jointed and wears a claret-colored satin ribbon around her neck. 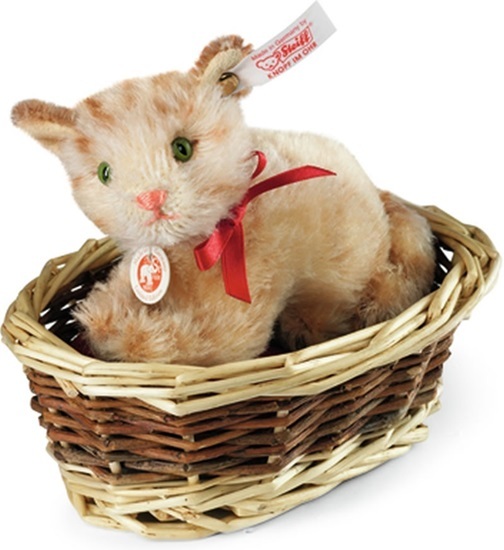 The gold-plated "Button in Ear" with a white tag indicates that she is one of 1,500 kittens in the valuable "Ginny kitten in basket" limited edition.